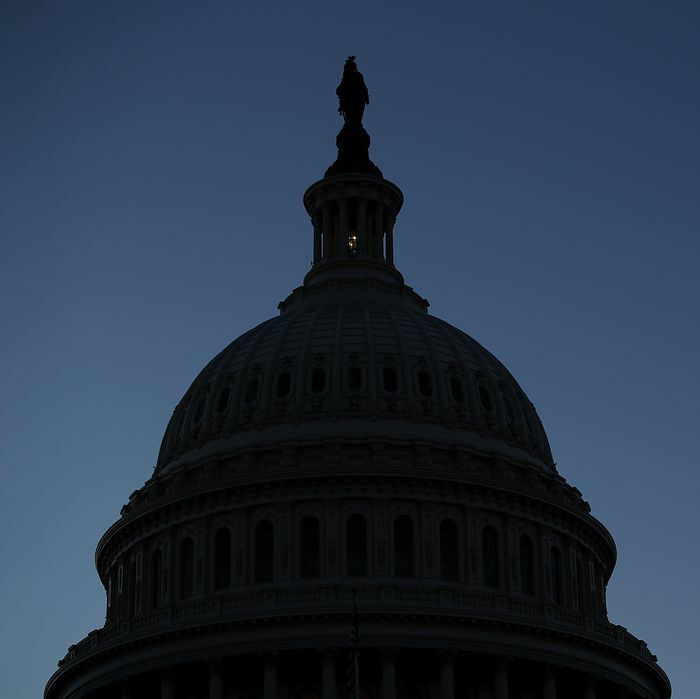 The long-standing wrangle over the provisions that need to accompany measures to keep the federal government functioning morphed from negotiations to pure Kabuki theater today. Ironically, the House conservatives who used their leverage to kill the possibility of an immigration deal that could have resolved the entire crisis helped pass a bill on a party-line vote (230-197) that they knew the Senate would not approve. It’s pretty obvious the point was to shift blame to the upper chamber, and especially its Democrats, for the shutdown that is very likely to begin tomorrow night. To go back a couple of days, House conservative opposition to an immigration deal that might give Dreamers relief without border-wall funding or sharp changes in immigration law led Speaker Paul Ryan to shift his strategy rightward. He designed a stopgap bill that kicked the spending fight down the road into February without any concessions to Democrats, while including a six-year extension of the Children’s Health Insurance Program, which everyone supports and Senate Democrats would be hard-pressed to kill. The idea was either to “jam” Senate Democrats with a bill they’d reluctantly vote for, or let those same Senate Democrats take the blame if the government shut down. But then House conservatives led by Freedom Caucus chairman Mark Meadows doubled down with more demands — including more defense money and a separate vote on a hard-line Republican-sponsored immigration bill — and things started to fall apart. At least three Senate Republicans said they’d vote against the stopgap bill. And then the red-state Senate Democrats the bill was supposed to “jam” started letting it be known they’d vote against it, too. A good part of the day on Thursday was spent counting votes in both Houses, with it looking increasingly likely that Republicans might not have a majority for the bill in either chamber. So this is all symbolic, and the best guess now is that Ryan convinced the conservatives that with the bill likely going down in the Senate anyway, the smart play was to let that happen and blame Democrats for the resulting shutdown and chaos, perhaps increasing House leverage when the crisis is resolved. Overnight the spin machines will whir. Possibly some sort of very brief, nobody-gets-anything extension of spending might be yet reached before the lights go off (my favorite idea is a two-week extension that would expire, fittingly, on Groundhog Day). But the big question at the moment is whether Republicans can convince at least two of their wayward senators to climb back on board and vote for the bill so that the GOP can argue it was killed by a Democratic filibuster. There is a hypothetical scenario where even if Democrats gave Republicans the necessary votes to at least start debate on the bill — on the “motion to proceed” vote, as it’s called — Republicans couldn’t pass it, as of now. Democrats wouldn’t really have anything to do with it. It would appear that Republicans have shut down the government. It’s anybody’s guess when the two parties and the two congressional chambers will actually be able to reach agreement on the various underlying issues. But don’t be fooled: All the House did tonight was get the bill off its plate and intensify the blame game. It’s reasonably clear that the person most responsible for this mess is the president of the United States, who blew up an immigration deal last week with a obscene racist tirade, and who posted a tweet this morning raining on the one true bipartisan parade, the CHIP extension.